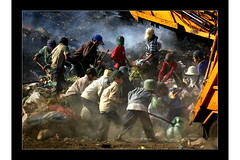 Child Labour Photo Contest 2012_Third Prize. Ever since the Brexit referendum, I’ve kept thinking that the hard Brexit plans surely must be due to a lack of understanding of the consequences, that the Tories would eventually opt for a much softer outcome (such as the Norwegian solution) or at least apply for a decade-long transitional deal to give them time to negotiate new trade deals and all that. I simply couldn’t see any benefit in causing utter devastation to so many people and businesses across the UK, so I kept believing the people opting for a hard Brexit must be ignorant or deluded. Then two things happened. Firstly, the leaked memo showed that people in government do seem to realise what they doing and what the consequences will be. Secondly, I started reading Naomi Klein’s “The Shock Doctrine”. If this is true – which I fear it is – a hard and chaotic Brexit will be a huge opportunity for the Tories to completely abolish the welfare state. They’ll be able to get rid of the NHS, free education, unemployment benefits and whatever else they don’t like. They’ll be able to do this while looking immensely sad, saying that it’s all the EU’s fault for denying them the package they wanted (but quietly always knew wouldn’t be acceptable to the other EU member states). They’ll blame everybody else for the economic collapse, but use it to create a neoliberal wonderland where only the strong survive. Eventually people will realise what has happened, but by then it’ll be too late to reverse. In their book Going South: Why Britain will have a Third World Economy by 2014 , Larry Elliott and Dan Atkinson claim the UK needs to make a fundamental choice: Should it move in the direction of a Scandinavian welfare state (similar to the Common Weal ideas currently being discussed in Scotland), or should it become a low-tax state based on free trade (called “Freeport Ho!” and “Freeport Britain” in their book)? They don’t really discuss Scottish independence in their book, and they seem to think that the UK must make the choice as a whole. However, it appears to me that Scotland and London have already chosen. Scotland wants to go down the Common Weal path (and what we’re really discussing in the independence referendum campaign is whether we can convince the rUK to go down that road with us, or whether we should do so alone), and Greater London has practically decided to become a global free port (which is why so many people in the South-East want to leave the EU, dismantle the NHS, and all that). What I didn’t foresee back then was that the Tories would be able to use the chaos created by their hard Brexit to implement this vision, which is so utterly different from the vision of an egalitarian society based of solidarity and fairness that the vast majority of people in Scotland share. If we can’t stop the Tories from administering their neoliberal shock therapy, we need to get out before it’s too late. We’re about to witness something that’ll make Thatcher look like a cuddly socialist in comparison.